By its simplest definition, cliff diving is exactly what it sounds like. It is an activity that involves highly-trained athletes diving into the water from a very high cliff. This is a risky sport that should only be attempted by people who have been given the proper training and have plenty of experience that allows them to soar from extreme heights and still land safely in the water below. Cliff divers are extreme sports athletes who have honed the acrobatic skills that allow them to take part in this challenging activity without receiving an injury. Today, there are cliff diving competitions held all around over the world, including in places like Mexico, Brazil, and Greece. Energy drink maker Red Bull runs some of the most dramatic competitions each year, with skilled divers leaping off rocky cliffs or platforms set as high as 85-feet in the air. These competitions routinely draw thousands of spectators who come to witness these incredible athletes performing amazing feats. 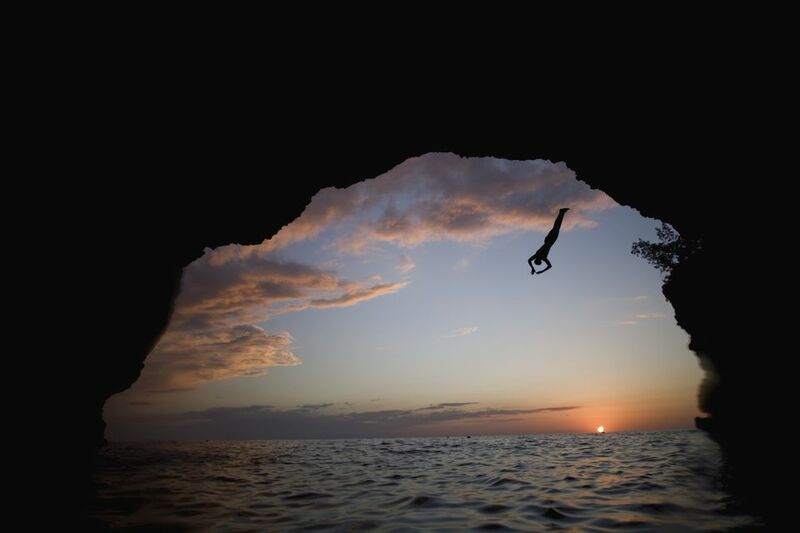 The history of cliff diving dates back nearly 250 years to the Hawaiian Islands. Legend has it that the king of Maui – Kahekili II – would force his warriors to leap feet first off a cliff to land in the water below. It was a way to show their king that they were fearless, loyal, and bold. Later, under King Kamehameha, cliff diving evolved into a competition in which participants were judged for style, with an emphasis placed on making as small of a splash as possible when they entered the water. Over the centuries that followed, the sport would spread to other parts of the world as well, with divers spending countless hours perfecting their skills to match the unique conditions of their home country. During the 20th century, the popularity of the sport grew considerably, with competitions now taking place in a wide variety of places across the globe. Today, cliff diving is still viewed as a very dangerous, and somewhat niche, activity that can result in serious injury or even death if not done properly. Modern cliff divers continue to push the envelope in terms of the heights that they leap from. For instance, in 2015 a new world record was set when a Brazilian-Swiss extreme athlete by the name of Laso Schaller dove more than 58 meters (193 feet) off a platform in Maggia, Switzerland. Those kinds of heights are extreme examples of the sport, however, with most competitions actually taking place in the 26-28 meters (85-92 feet) range. In comparison, Olympic divers jump from a maximum height of just 10 meters (33 feet). If you’re thinking about becoming a cliff diver, consider seeking the advice of experienced athletes in the sport who already compete in extreme competitions around the world. They emphasize the importance of being technically trained, being in excellent physical condition, and diving many times from lower heights before ever attempting a plunge off of a high cliff. Even then, many other factors have to be taken into consideration, including the weather, waves, and terrain – both on the cliffside itself and in the water below. Wind conditions, in particular, can play a major role in landing safely, although the placement of rocks and other obstacles are important for divers to be aware of as well. Anyone who wants to learn to cliff dive is encouraged to find an experienced instructor who can show them the ropes or visit the USA Cliff Diving page on Facebook. Members of the page often share tips, and videos, and can be very helpful for anyone looking to get started. The page is surprisingly active and the videos shared there are enough to provide an adrenaline rush completely on their own. But, for those who still want to add this skill to their adventure resume, the group can point them in the right direction. Other options include joining a cliff diving class, as there are schools located all over the world. For instance, Cliff Diving Ibiza offers basic one-day courses for those looking to get started, while the World High Diving Federation also makes a good resoruce.